I hope not to sound too much like Morpheus if I tell you that the human body is an amazing source of energy. As long as given food, water and oxygen, it will burn hydrocarbon chains to keep a steady temperature of some 37 ºC in a wide range of situations, activities and external weather conditions. We use that energy in every interaction with the world. When I push these plastic keys against their springs, so that they can come in touch with the other contact of their respective switches and send an electric signal to the CPU (who will process it and translate it to that precise letter shown on my screen), I’m using the body energy to produce some work on them, which overcomes the stiffness of the springs and produces an elastic deformation that will be recovered the moment I raise my finger from them, so I can press them again and make that same letter appear onscreen if I want to. In nearly every other action we do, the same scheme applies: we transfer some of our body energy to some other object of the external world (e.g., to the floor when we walk, to the door handle when we open it, etc) by means of work. But we also exchange heat. Work and heat are the two only ways we know of exchanging energy among physical systems. Heat, however, is more difficult to manage than work, as it flows continually and unstoppably from the hotter bodies to the colder. Heat tends to be a real pain for the most part of our machines, which are intended to produce work: when you drive your car, it’s work what impulses you, and what you want from the fuel burning in its engine; but it’s work and heat what you get. Heat shows at the party, unwanted and uninvited, and treats herself to a rather nice portion of the energy cake. As a result, not only this whole share of energy will be kept from becoming useful work, but also there will be a temperature increase caused by this waste heat. Even more work will have to be consumed on running the cooling system to ventilate all that heat out of our dear machinery. All this finally adds to rather disappointing engine efficiencies of 35-40% for internal combustion motors, with little room to improve them. We can use energy to produce either heat alone (like in a kitchen fire or a heating system) or work + heat (like in every single mechanical or electrical machine), but never work alone. That doesn’t mean heat is bad. We need heat. It’s the heat coming from the Sun what gives life to the complex system that is the Earth. If it wouldn’t travel 150 million km through space to warm our planet, the Earth would be little less than a deadly-cold barren mass of rock revolving around a blazing star. So, we know two things about heat: 1. We can’t keep it from messing up. 2. It will always flow from the hotter places to the colder. This means that, as long as the ambient temperature is colder than 37 ºC, there will be at least a slight transfer from every human body to its surroundings. And, the bigger the difference is, the faster and more intense that heat transfer will be. In a low-temperature environment, it’s heat escaping our bodies what makes us feel cold, and what can kill us by hypothermia or freezing if it becomes too massive. That’s why we wear clothes. Clothes are not warm: they don’t warm you, they just insulate you from the cold outside, so the heat transfer is impaired and your body can manage to keep its temperature stable. So, heat does flow away from us. Why, then, don’t we take advantage of it? It turns out we’ve always done. Like with clothing, a good insulation is at the basis of all air conditioning system. A poor insulation results in massive energy expenses to keep the room from overheating in summer and overcooling in winter, since little or no resistance helps keep heat where it suits us: outdoors at summer and indoors in winter. On the other hand, a good insulation can result in great energy savings. 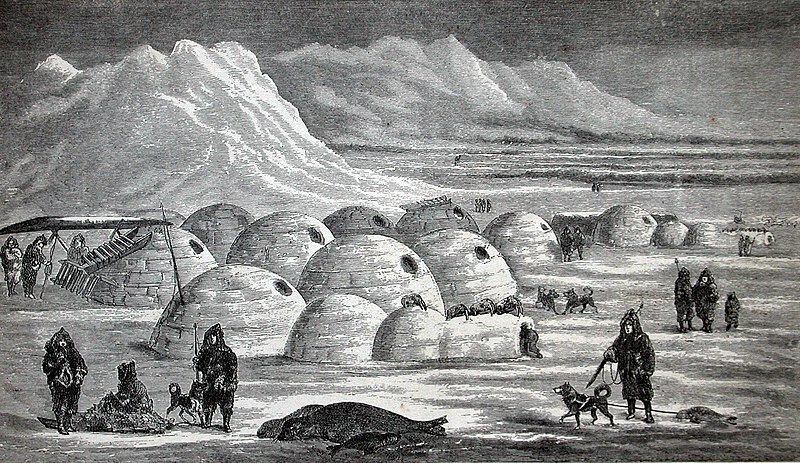 The utmost example is the igloo: relying on body heat and a smart architecture alone, an igloo can naturally maintain an interior temperature up to 40-50 ºC higher than the one outside. But you don’t need to live in an igloo to benefit from the combination of human heat and a good insulation. Normal houses are often too large and hold too few people to be heated by their inhabitants alone, but some public buildings can. 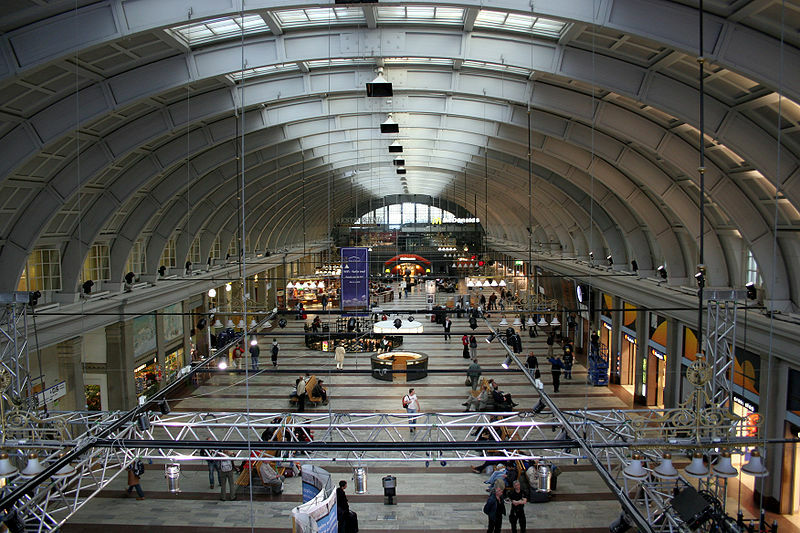 For instance, with more than 250.000 passengers daily passing through, Stockholm Central Station has no lack of heat sources. These quarter million commuters produce more heat than the building needs, even in the cold Swedish climate. It may struck you that in the dead of winter, with Stockholm’s outdoor temperatures ranging from -10 ºC to 0 ºC, its main train station would need cooling, if all that surplus heat hadn’t been cleverly put to a better use: it is recovered by means of heat exchangers and diverted into the heating system of an office block across, thus reducing its energy costs up to a 25%. Truth be told, far from all Stockholm Central Station’s heat surplus comes directly from human bodies. Plenty of other major heat sources are present at a train station daily life which cannot be disregarded: trains, electric systems, ovens, microwaves, coffee-machines… Even refrigerators and cooling systems produce heat! (Some other day we’ll discuss this). It’s hard to judge which part of the total is of purely human origin, but I don’t think it to be relevant: the point is all that heat comes from human activity, and that it can be either let go to waste or taken advantage of. In this direction, some other interesting initiatives are taken. Not far from Stockholm, in Helsinki, Finland, they are using waste heat from an underground data center to warm as much as 500 houses, thus saving an amount of energy equivalent to that generated by a large wind turbine. Though still at an early stage, in France, Paris subway system is also testing passengers’ body heat harvesting. And in a club in Rotterdam, the Netherlands, the energy transmitted to the floor by dancers helps powering the lights and sound system. Every human being is said to generate up to 100 W. It may not look much, but it is an ubiquitous, renewable and clean source. Moreover, we’re definitely a lot of people. Provided that we could harvest it all (which is by all means impossible), a big city like London, UK, (8 million inhabitants) would provide 800 MW of human energy alone. That is comparable to most nuclear power plants. And, as we have seen, human heat is not the only source of power that we’re continually letting go to no avail: waste heat recovery from computers (data centers) and machinery could lead to even more crucial savings. In a world where energy demands will inevitably and constantly rise, letting all this power go to waste is not desirable, nor economically, neither environmentally. Sources: AltTransport, BBC News, GOOD Design, HowStuffWorks.com, Planet Ark, Reuters, Treehugger.com, Wikipedia. All images come from Wikimedia Commons. • the often uncharted areas beyond a coastal district or a river's banks : early settlers were driven from the coastal areas into the hinterland. • an area surrounding a town or port and served by it : the city had grown prosperous by exploiting its local western hinterland. • the remote areas of a region : the mountain hinterland. • (figurative) an area lying beyond what is visible or known : in the hinterland of his mind these things rose, dark and ominous. ¡Barco de hormigón a babor! What do civil engineers do for you? This blog is written under a Creative Comons License.